As per the turnout and requirement, Pendolsare allotted for accommodation to Warkaris at Visava and Vihar primices. (Waterpruf pendolsduring shree Punyatithi Utsav). Every year the number of Dindis increase with 25 to 30%. These Pendols have approach roads, basic facilities with safety measures and boards showing Pendol and gate number. Sevadhari (volunteers) groups perform their service to clean the premices. There is arrangement in Pendol to dry the wet clothes. Groups of volunteers look after the warkaris in Pendols with great concearn and necessary guidance on PA systems and the above arrangements markes the stay of Dindies very smooth in shegaon. There are tubelight in pendol and lighting systems around the premices at night. The warkaris participating in festivels of Shree Sansthan never starve and Sansthan provides food arrangement (Mahaprasad) for warkaris at free of cost. 24 hours food arrangement made by Sansthan helps warkaris to have food at any time of their arraival. There is a systematic arrangement of Mahaprasad Bari (queue for Mahaprasad), its distribution and pendols made for having Prasad. Even 10 queues at a time are served Prasad to the warkaris, with sufficient light arrangement at night also and good hygiene. Majority of Warkaris in Dindies are comes from rural parts. 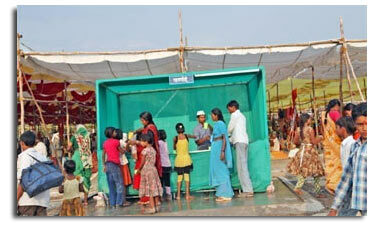 Sansthan helps them with enqiry booth at different places. Enqiry booth provides the guidelines to problems feel by Warkaris. Two experienced volunteers are deputed to provide the correct information to Warkaris. Anand Vihar and Anand Sagar Visava have the first aid centers with an ambulance to look after the Warkaris.Special tents are available with all necessary arrangements for medical aid. A good muber of doctors and their team works round the clock with medicines. 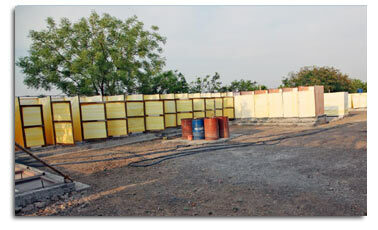 Anand Vihar and Visava premices are well equipped with huge special arrangement for bath with 1000 taps. 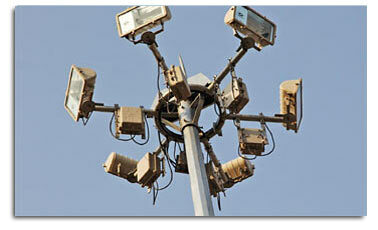 Sansthan has systematically arranged parking facility for the vehicals of warkaries coming from far and distant places. The chlorinated drinking water for warkaris is made available for 24 hrs at difrent places like registration office, parking, Mahaprasad Bari, first aid center etc. Separate toilets for men and women are available near accommodation (Pendol) with all cleanlimess and hygiene. The entire premises of accommodation is well illuminated. An additional generator is kept ready in case of power failure. All safety measures are taken to avoid the short-circuit and any casualty. A well trained volunteers look after all these things. Either in visava or vihar premices, kirtanis arranged for warkaris coming for festivals. Value Education Department of sansthan invites a well known kirtankar Maharaj to enlighten warkaris. It is arranged in Bhojan Mandap [ Mahaprasad Tent] at 9.00 to 11.00 pm.